First of all, can we say a hearty THANK YOU to all of our followers and readers? The feedback from our initial post about the Real Life Plant Parents series has been nothing short of amazing. Our calendar is already filling up and we are so excited to get to know our interviewees! This month, we’re starting with Meredith, who started collecting plants about a year ago - and her collection has grown into a serious indoor jungle. In this post we’ll get to know her plants: where they stay in her house, which are her favorites (shh, don’t tell), and which ones are on her dream plant wish list. You can follow her on Instagram @candidlycozy. 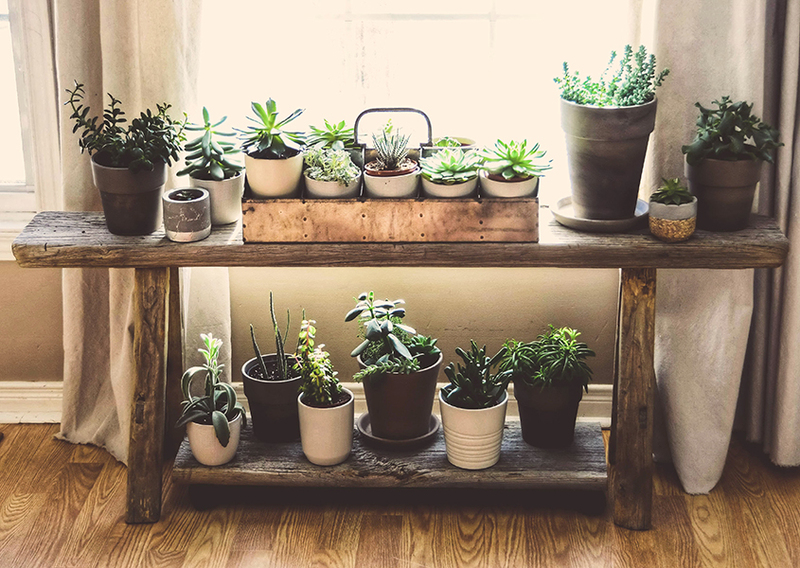 To get things started, we asked Meredith the number one plant parent question: How many plants do you have? I currently have almost 50 plants, styled and staged in three designated areas throughout my home. My sun loving tropicals and succulents get a front row window seat in the living room. My lower light lovers hang out in my dining area, and my high humidity plants camp out in the master bath. 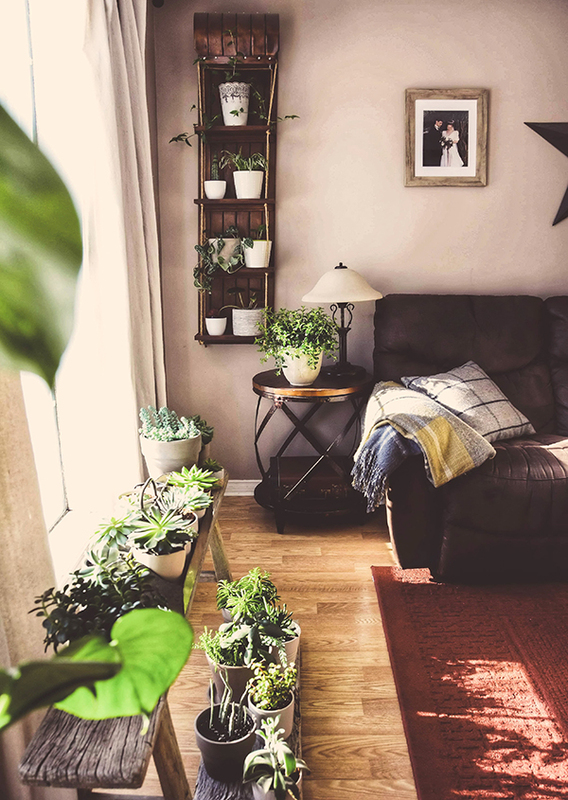 Before she started really getting the plant bug, Meredith had two Pothos plants. She had one since college when her dad thought she needed a plant for her first apartment, and he bought it at a yard sale. She even still has the original plant! More recently though, Meredith was inspired by the DIY home decorating trends she saw in popular media. I'm a huge fan of DIY, home renovation shows, and Pinterest. It was because of these influences that I began to notice the idea of styling interiors with plants. I started with small succulent varieties not trusting myself to keep up with watering, but as they thrived I grew (no pun intended) my confidence in expanding my plant family. As a DIY lover, Meredith has even created her own plant stands and display furniture for her home. Her husband also made her a shelf from their kids’ old sled, and it looks amazing! I love my plants so much, I've created my own display shelves. One is an old toboggan from when my children were little. My husband converted it into the most amazing shelf, and now it's the perfect window spot for indirect bright light plants. I also have a great barnwood bench my dad found me, which I use as my direct sun window seat for succulents. As fate would have it, I came across a piece of barn board which happened to match the bench exactly. I added some wheels, and voila, a spot for more sun loving plants that can be rolled in and out easily to the sunniest spots from under the bench. In the kitchen I made a three tiered, wheeled shelf, out of wood and plumbing supplies from the hardware store, inspired by the industrial looking DIY projects on Pinterest. Again it allows for easy movement into spots that catch a few more rays. Not only do I enjoy the thrill of the hunt, finding an uncommon plant, I also spend a ton of time finding just the right pot, and spot. One of my hobbies is photography, I take plenty of stylized plant pics to share on my Instagram as well as spending time reading about plants in beautiful plant books, good thing I happen to work at a library! My green gang also includes some plants from the Wild Interiors® collection, which happen to come in fab pots that match my decorating style. You might be wondering if Meredith could possibly have a favorite, given the enormity of her collection. The answer is: of course she does! Of all my plants, the hands down favorite is my beefsteak begonia (Begonia erythrophylla) which I've nicknamed the mother-in-law plant. It's a plant considered to be vintage, once popular in homes ages ago, but now usually only found by sharing cuttings. My mother-in-law has had this particular plant since she was first married (over 50 years ago). She had acquired it through clippings from her mother-in-law, who had passed long before I came into the picture. Now being married to her son for over 20 years, my mother-in-law, noticing my growing plant collection, shared a clipping from her beefsteak begonia to me. It initially took almost 3 months to finally produce, however now I have a beautiful vibrant vintage plant for myself. I like the idea of when I eventually become the mother-in-law, then I too will keep this tradition going to pass on a cutting to the next generation. We find that a lot of plant enthusiasts have a list of plants they covet and want to find. Meredith told us about her other favorites from her collection along with the plant she’s always been on the hunt for. I do have a few others that I adore and admire. One would be my satin/silver pothos, and my newest addition the goldfish plant, which I hear can be a challenge. I love the graphic look of my Alocasia and split leaf philodendron. I can't leave my happy little lithops of my list of favorites either. The one plant that continues to elude me is the string of hearts. I've looked at every plant shop in the area to no avail for about a year now. I was given six small cuttings, of which only two strings are currently still alive. I obsessively check it each day, hoping by my own sheer will those two tiny pieces will take. I have hope someday a whole plant will come my way. Are you interested in sharing your story too? Fill out the form here or email us - info@wildinteriors.com.